I really like cinnamon. I mean, a lot. It's a strong flavor and I love strong flavors. I have been sprinkling it on my coffee for a long time, which I read recently has some great health benefits. Who was ahead of the crowd? This girl! Anyway, I wanted to make something cinnamony, again. I am using up all my flour before I go on a health kick. If you could all pray for me that would be fantastic. I made these cinnamon knots Sunday. They were a really nice, lightly sweetened treat and very easy to make. I thought I would share them as a part of Take it On Tuesday. Betsy was nice enough to feature the Mason Jar Tumbler I made last week. In a bowl stir flour into the yeast/water one cup at a time. Then add your sugar, vanilla and cinnamon. Mix until it pulls apart like elastic. Flour a surface and roll your dough into a tube. In a bowl mix your tbsp brown sugar and 1 tbsp cinnamon. 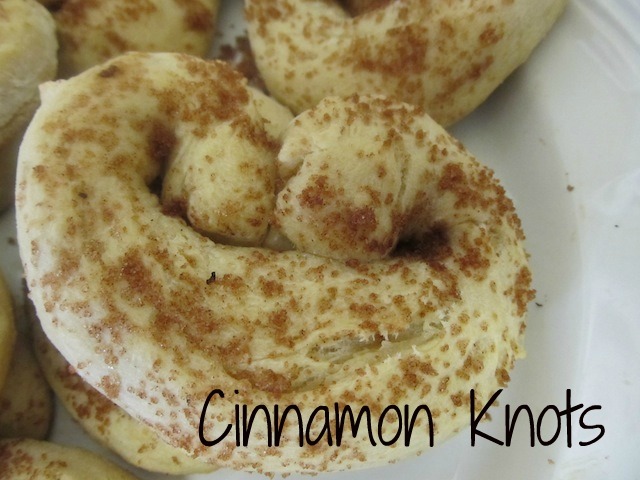 Sprinkle the dough with brown sugar and cinnamon.